In this post, Education Consultant Kristine Scharaldi shares some tried-and-true methods of teaching STEAM lessons while playing with bubbles. 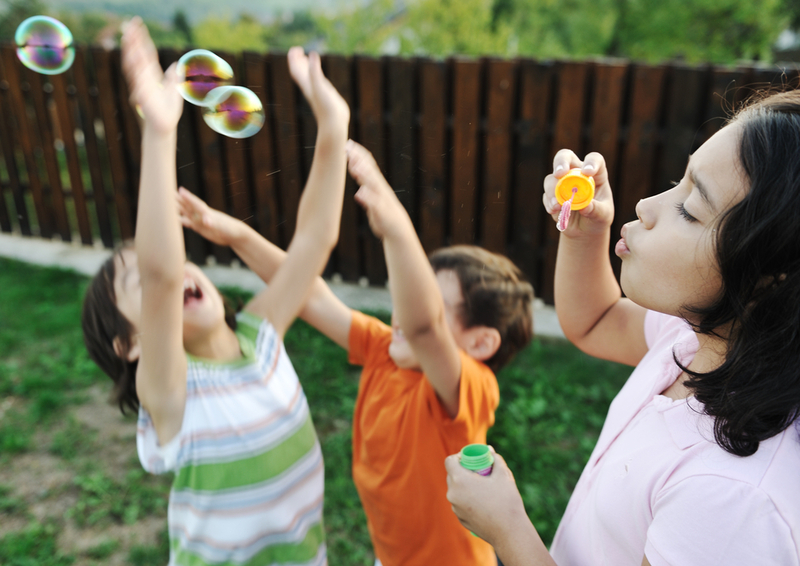 Blowing bubbles is such a classic outdoor activity that can be enjoyed just about anywhere! Not only is it fun to do, but there are lots of ways that exploring bubbles can engage kids in concepts related to math, science, and engineering. It is also very easy to encourage creative expression and wonder through playful experiences with bubbles. Here are simple and inexpensive ideas that can be done with limited time and supplies that provide opportunities for students to inquire, discover, and create with bubbles. A trip to the dollar, discount, or toy store in the summertime will likely offer plenty of options for ready-to-use bubble play items. This is also a good place to purchase drinking straws, pipe cleaners, liquid soap, small buckets, and inexpensive items such as flyswatters and funnels that can be used in bubble-making activities. There are lots of materials found around your house or classroom, too, that can be incorporated into bubble activities. Store-bought bubble solutions and wands are one way to get started. But to help kids develop an understanding of the science of bubbles it is ideal to also experiment with water and homemade bubble solutions. The popular article The Science of Bubbles shares a bubble recipe and explains why bubbles are round, why they pop, and why they stick together, and is an excellent read before leading a bubble activity. 1. If kids try to blow bubbles with plain water they’ll see that the bubbles do not come together and float in the air like they do with the bottled bubble solution. Then they’ll determine that there must be an ingredient or something more than just water that allows the bubbles to form. The kids can think about their past experiences with bubbles, such as taking a bath or washing dishes, and then identify some household items that are used for cleaning, including shampoo, soap, dishwashing liquid, etc. Create lists and see what ingredients they may have in common. 2. Another fun bubble activity is trying to make your own bubbles. Kids can come up with their own “formulas” to test and compare. They can experiment with varying amounts of a soap product and water types (hot, cold, distilled, etc.) to determine what helps creates the longest-lasting bubbles. Then print out a few bubble recipes and see how they compare. 3. Kids can also experiment with different objects to make bubbles and make predictions about what might happen when they wave or blow into each item. Will using wands of varying sizes and shapes have an effect on the bubble created? Does it make a difference if you blow into or wave the object fast or slow? The kids can have fun while making observing and thinking critically, and coming up with their own questions and things to try. For example, a child might want to build a custom bubble wand using straws, pipe cleaners, or other materials and see what happens. 4. If the technology is accessible, older kids can design and fabricate wands, and even bubble machines, using 3D printing pens and robotics kits. Kids might want to engage in challenges such as making the biggest bubble or tallest bubble “tower.” Using the engineering design process, they can plan, build, test, evaluate and redesign their bubble-makers, or perhaps an obstacle course for their bubbles to travel through. 5. There are natural connections to math concepts as the kids inquire and play. Opportunities to count, explore geometry and shapes, and measure distance and time are easily incorporated. They might want use a timer to find out the duration in seconds that they can blow one bubble, or how many seconds until a bubble pops. Perhaps they want to invent a game to play with the bubbles, such as, who can pop the most bubbles in a minute? With a group of kids, they can pair off to play in partners and work together to blow up and pop the most bubbles in competition with the other teams. Kids can work together to measure the diameters of their bubbles while being blown up and how far their bubbles travel. Using pipe cleaners and straws, kids can build three-dimensional shapes, such as cubes, and dip them in bubble solution, creating multi-sided bubbles inside the structures (also tying in engineering concepts as they as they form inverted “tensile” bubbles). 6. As students create and discover, arts and technology can enrich the experience. Kids can play music while waving bubble wands and free dance as expression, or even perform dance routines. Kids can create or use musical instruments to play their own music while also blowing bubbles, such as inexpensive plastic harmonicas and flutes. 7. By mixing a couple of spoonfuls of tempera paint with water and a little bit of dish liquid in a cup, kids can make colored bubble solution that they can blow and “catch” onto paper to create bubble paintings. Mobile devices, such as smartphones and tablets, can be used to take pictures and videos of the activities to view and share. Time lapse photography of the bubbles, and original movie-making of the bubble performances, are some ways kids can produce digital creations from the activities. No kids this summer? Save these ideas for the school year and bring memories of summer back while engaging your students in STEAM fun!